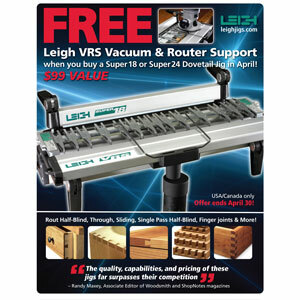 Highland Woodworking is offering this great promotion for just a few more days: If you purchase a Super 18 or Super 24 Dovetail Jig before April 30, you get a Vacuum and Router Support system for FREE. The VRS is estimated to be a $99 value, and a great addition to the Dovetail Jigs. Woodturning Newsletter: The Highland Woodturner is NOW AVAILABLE! What happened to my tool(s)? ?